I'm not even a football fan but I'm into the Super Bowl madness on South Beach. I got up early to go to see Gloria Estefan on the Early Show that was shooting live two blocks from me. The crowd went wild for Gloria. 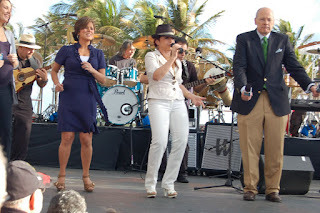 Photo: Gloria Estefan and the Miami Sound Machine performing with Harry Smith and Maggie Rodriquez dancing. Genial post and this mail helped me alot in my college assignement. Say thank you you for your information.